Martinez Dental Solutions offers composite fillings and dental bonding to patients in Jacksonville. These cosmetic dentistry procedures are both corrective and aesthetically pleasing for patients who are experiencing tooth decay or cracked and otherwise damaged teeth. Composite fillings are similar to amalgam fillings in that a tooth with a cavity is drilled and then filled with a material that hardens inside the tooth. However, with composite fillings, a tooth-colored material is used instead of metal. As a result, the filling is barely noticeable. Amalgam fillings use a blend of metals such as silver-tin alloy, mercury, and copper. This mixture hardens inside the tooth and appears silver in color. Composite resin fillings are a mixture of acrylic and quartz fillers that are the color of natural tooth. This mixture hardens within the tooth in about 30 seconds. In addition to being more attractive than amalgam, composite fillings actually bond to the tooth which can strengthen and protect the tooth. Dental bonding is a procedure that uses a tooth-colored composite material to improve the appearance of a tooth. For example, composite fillings are a form of dental bonding. Bonding can also be used to make teeth appear longer, to reshape teeth, to repair chips and cracks, to even a tooth's coloring, to close gaps, and to protect the exposed portion of a tooth's roots after the gum line has receded. Dr. Jose M. Martinez has been performing dental bonding since 1992 and can help you achieve a more beautiful smile with this treatment. 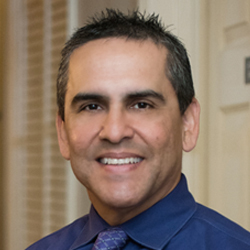 Whether you have older fillings you'd like to replace with composite fillings, have a new cavity, or have other issues that could be corrected with dental bonding and composite fillings, Dr. Jose M. Martinez is available to help.